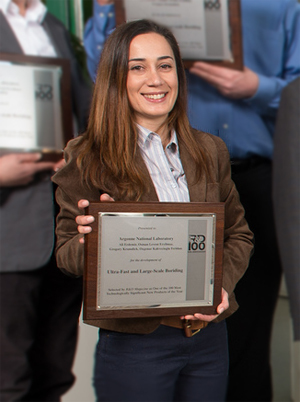 Postdoc Ozgenur Kahvecioglu Feridun (ES) was part of a team that recently won a 2012 R&D 100 Award for a novel ultra-fast and large scale boriding technique. Boriding is a thermo-chemical surface hardening process in which boron atoms are diffused into the surface of a work piece to form complex borides with the base metal. Many boriding methods exist, but the ultra-fast technique used by Feridun’s team speeds up the process from eight hours to 15 minutes. Feridun’s role was the design and construction of the large boriding furnace. This included material selection and optimization of process parameters for the pilot and large scale furnace. The end result was a four ton furnace that operated at 1652-1832°F or 900-1000°C. “Starting with a 250 gr. crucible (8.818 oz.) and ending up with a four ton furnace is not an easy thing,” says Feridun. The scaling up of the furnace was a major effort. Feridun ensured that the construction materials would be able to withstand the intense temperatures and not degrade mechanically, physically or chemically over time. Several of the features she designed for the furnace were the first of their kind such as a special safe liner. This liner or zone protects the furnace from molten salt penetrating throughout the walls of the furnace and spilling over onto the ground. She also experimented with using a less corrosive electrolyte which also used less electricity and allowed for better control of the end product. The furnace that she created acts much like a molten salt electrolysis bath in which the materials to be coated, generally industrial parts, are the cathodes that are placed inside this bath. The electrochemical boriding happens by applying cathodic current to the industrial parts for 15-30 minutes. Depending on the desired results and coating thickness the variables such as current, temperature and process time can be changed. The finished product is a surface that has a much more uniform coating that lasts longer and protects the surface of the industrial part much better. During the creation of the furnace Feridun enjoyed brain-storming as well as sharing ideas with her team. Working with Argonne Distinguished Fellow Ali Erdemir, Osman Eryilmaz, Vivekanand Sista and Greg Krumdick was an enjoyable experience. “No one had the same major,” says Feridun. “This was a plus which allowed us to view and solve problems from a different angle.” She found team work provided her with opportunities for personal growth and creativity. She learned that everyone has unique skills and experiences. The combination of the team’s skills and knowledge leads to success. Ozgenur Kahvecioglu Feridun (ES) holds a bachelors of science in Metallurgical and Materials Engineering, a masters of science in Extractive Metallurgy and a Ph.D. in Materials Science and Engineering, all from the Istanbul Technical University in Turkey. She currently is working on a scale-up project on lithium-ion battery research with Greg Krumdick and YoungHo Shin. This entry was posted in Postdoc Awards and tagged Ozgenur Kahvecioglu Feridun, R&D 100 Award. Bookmark the permalink.